The trade deadline is approaching fast -- February 26, 2018. As such, I've already been studying the history of the trade deadline, and exploring what various organizations might be doing for the next month and two days. As I wrote in my recent piece for ESPN, "since 2005, there has been an average of 40.6 trades in the month leading up to the deadline, 21.3 of which occur on the final day and 7.3 in the two days previous, based on the raw data made available at Pro Sports Transactions." Here is that information in chart form. Obviously, some organizations tend to be more active than others. Specifically, the Ducks and the Coyotes tend to make a lot of deals, while the Red Wings, Stars, Predators and Islanders are known for making very few. You can't always go by what you see on the chart, of course. For example, if the view was restricted to just the six seasons since they moved from Atlanta, then the Winnipeg Jets would be at the bottom of the chart, not the Red Wings. It's also interesting that Lou Lamoriello didn't make every many moves when he was with the New Jersey Devils, but has been quite active with the Toronto Maple Leafs. In some cases, teams are very active when they are sellers, but don't so much as buyers -- Detroit may fall into that category. Finally, we really don't know what to expect at all from Buffalo or Los Angeles, who have brand new leadership. So, it should be an exciting year. My piece for NHL.com is about the red-hot Colorado Avalanche, whose 10-game winning streak came to an end last night in Montreal, 4-2. To demonstrate how impressive this is, Namita (@nnstats) calculated that the odds of a 27-19 team achieving this feat is about 25-to-1. With that loss, that leaves just two teams undefeated in 2018 in regulation time, Calgary and Boston -- the latter of whose streak dates back to December 14, and is expected to stay that way the longest. So what's to credit for Colorado's surprising winning streak, which has lifted them back into playoff contention? Of all factors, the conventional wisdom is that Nathan MacKinnon deserves the lion's share of the credit. I have a different theory about their winning streak, eight games of which occurred at home. Colorado has the second-best record in the NHL at home, but has been relatively easy to dispatch on the road. Why? The key advantage to playing on home ice is getting the last change. That allows coaches to match lines, and to get their top offensive players in advantageous situations, shut down the top opponents with their best defensive players, and shelter their weaker rookies and depth players. Theoretically, those with the biggest differences between their home and road records have the greatest need to do this. 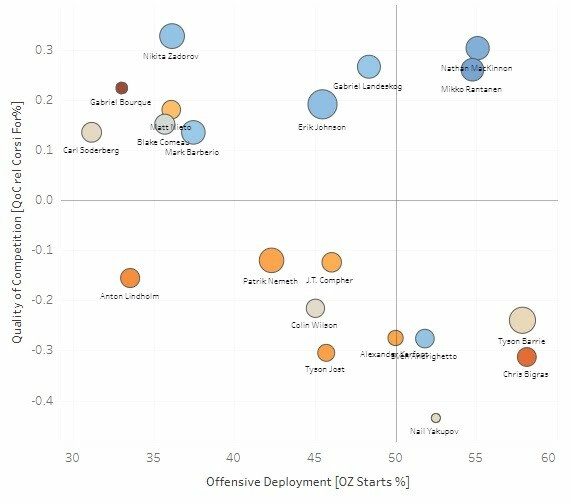 Continuing this example, at home Jared Bednar can make sure that MacKinnon, Landeskog, and Rantanen avoid the top opposing checkers, he can get Carl Soderberg, Blake Comeau, Matt Neito and defenseman Erik Johnson against top opponents, and then carefully shelter the secondary players, which include an average of 4.4 rookies per night. On the road, he can't do that, and opponents can target MacKinnon, avoid Johnson, and feast on the depth lines. Every team has to contend with this, but few teams have the same disparity in talent between the top players and the depth. If my theory holds water, then Colorado might fall out of playoff contention in their next 14 games, 11 of which are on the road. If I'm wrong, well then I'll learn something new by studying their games closely. The recent discussions on Auston Matthews and the difficult cap management choices the Toronto Maple Leafs have ahead of them has prompted some fans to re-visit how the Washington Capitals handled their cap-related woes this summer. For better or for worse, the Capitals let Karl Alzner, Justin Williams, and Marcus Johansson sign elsewhere for a combined total of $13.7 million, let Nate Schmidt go in the expansion draft, and invested $18.65 million long term in Evgeny Kuznetsov, T.J. Oshie, and Dmitry Orlov. At the moment, Washington is first in the tough Metropolitan division by five points, leading to the popular perception that they have navigated the salary cap as well as teams like the Chicago Blackhawks. 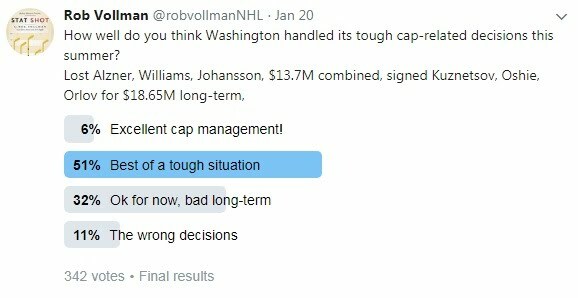 About a third of fans are happy now, but have raised legitimate long-term concerns about the decisions that the Capitals made. Based on the contracts that were signed, it might have been best to keep Schmidt on defense instead of Orlov or Alzner, to trade away Kuznetsov for a replacement No. 4 defenseman (and possibly some picks and prospects), and then use the extra cap space to retain all three of Oshie, Williams, and Johansson up front. I know that there's some reluctance to part with someone with Kuznetsov's upside, but the salary cap era isn't about having the best players, it's about having the best bang for the buck. Kuznetsov has the 22nd highest cap hit in the NHL, but is tied for 32nd in scoring -- even with a solid 43 points in 48 games. Plus, when you consider goalies, defensemen, and defensive-minded players, Kuznetsov probably ranks even lower among NHL players, possibly even outside the top 50. And, at 25, he's likely already at his peak right now, and won't get significantly better over the duration of his contract. To be clear, I'm not arguing that trading Kuznetsov is absolutely what Washington should have done, I'm just suggesting the possibility that it's the kind of move that was worth strong consideration. There was a minor ruffle in the hockey analytics community this week, with very public accusations from prominent names that ranged from failing to properly research and/or cite one's work, all the way to outright plagiarism. I don't know enough to weigh in on any specific case, but I agree in spirit with the philosophy of looking for and mentioning existing research on a topic before diving into it. In fact, it was tip No. 4 for contributing authors, in Hockey Abstract 2017. However, I know first-hand how hard it is to keep up to speed on everything that's out there, so it's understandable that some pretty notable studies get missed. In fact, even some of those who were pushing this point the hardest on social media have at some point been unaware of contributions so well-known and so significant that their ignorance appeared to be deliberate -- but it rarely is. Obviously, the controversy made for a difficult week for those involved, and I feel for them. However, the silver lining is that we are finally starting an important discussion about something that has been going on for a long time but was never really mentioned until it applied to the specific personalities involved in this particular case. Nobody can stay on top of everything, but an honest effort to mention related studies is worth investing a little extra time, in my opinion. However, how people invest their time, and the balance that people strike between promoting their own work and that of others, are matters of personal taste that can vary dramatically from one individual to another. If you found this whole incident upsetting, the best way to deal with it might be to adjust your own.